Overview The International VLBI Service for Geodesy and Astrometry (IVS) holds a General Meeting every two years. The purpose of the meeting is to assemble representatives from all IVS components to share information about results and developments in all aspects of VLBI. The meeting is the platform for discussions and coordination of future activities. The meeting also provides a forum for interaction with other members of related VLBI and Earth science communities. The keynote of the third General Meeting will be visions for the next decade following the main theme of "Today's Results and Tomorrow's Vision". The outstanding VLBI results available today are the foundation and motivation for the next generation VLBI system requirements. All speakers are encouraged to address the results of today and to consider possible future directions. The content of the meeting will be of interest to the broad spectrum of IVS members as well as to the wider VLBI and Earth science community. All IVS Associate Members and individuals who have interests in the various applications and research fields of VLBI such as geodesy, astrometry, Earth sciences, and related fields are encouraged to attend the meeting and to make an oral or poster presentation. Non-IVS members are cordially invited to attend the meeting and to make a presentation. The meeting will be held at the Lord Elgin Hotel in Ottawa, Canada. The meeting will be held during the Winterlude festival. The meeting is being hosted by the Geodetic Survey Division of Natural Resources Canada (English) or (French). Schedule The overall schedule of the week includes the General Meeting sessions plus related meetings. Call 1-800-267-4298 and mention you are booking with "International VLBI Service". Fax 1-613-235-3223 and mention you are booking with "International VLBI Service". Go to the hotel website www.lordelginhotel.ca, click on Reservations, then click on Group Accommodations. Please provide the name INTERNATIONAL VLBI SERVICE. Fill the form as directed and when complete press send. The cost of a single room will be approximately $125 Canadian. A regular Airport shuttle services the Lord Elgin hotel daily every half hour at the cost of $12.00 one way and $20.00 return. Taxi fare is approximately $25.00 one way between the hotel and the airport, and is more convenient. The total time for the trip is about 20 minutes. For the very frugal, Ottawa bus route 97 runs from the Airport, exit at the METCALFE Stop and walk one block south on Elgin; fare is $2.50; information at www.octranspo.com. Registration The registration fee will be $250 Canadian or $200 US payable at the meeting. Payment can be accepted only in Canadian or US dollars, payable in either Traveler's Checks, cash, or a personal check from a US or Canadian bank. The deadline for registering is January 9, 2004. Late registration will be accepted until January 23, 2004. Please use the late registration form to register for the meeting. The Program Committee and session conveners prepared the following session descriptions. Wayne Cannon This session will invite welcome and keynote speakers. The keynote for the third General Meeting will be visions for the next decade following the main theme of "Today's Results and Tomorrow's Vision". The outstanding VLBI results available today are the foundation and motivation for the next generation VLBI system requirements. Arthur Niell The VLBI2010 Working Group is examining requirements for VLBI geodetic systems to 2010 and beyond, including all components from antennas to analysis. This session solicits papers on the progress to date, exploring such issues as 1) Modernization of VLBI data-acquisition systems for higher stability, reliability, wider bandwidth and lower cost, 2) Small, low-cost, fast-moving antennas, 3) New observing strategies, 4) Optimum and practical observing frequencies, 5) Fully automated observations and remote monitoring, 6) Transmisson of data via high-speed network (e-VLBI), 7) Possible correlator upgrades, and 8) Fast turnaround of results by full pipelining of data from antennas to correlator to final analysis. Kerry Kingham This session focuses on the recent activities and future plans at VLBI networks, stations and correlators. Presentations about the efforts at networks, station or correlator sites to improve VLBI data quality and hence the IVS products are solicited. Also welcome are submissions concerning the IGGOS Project's contributions to local surveys to determine the spacial vectors from the radio telescopes to collocated geodetic instruments. Network station status reports should be submitted to this session, but should be presented as poster papers. David Lapsley New technical challenges and ideas will be an essential part of realizing the next generation of VLBI systems. This session welcomes contributions from all aspects of new VLBI technology, including data systems, e-VLBI, instrumental calibration and other critical VLBI technology components which stimulate discussions for the VLBI2010 initiative. Zinovy Malkin One of the objectives of IVS is to serve users with the most accurate and reliable VLBI products. A broad variety of analysis strategies and software of high quality is important for two reasons: Firstly, results of single Analysis Centers can be cross-checked concerning gross errors and the influence of subjective decisions of individual analysts can be identified or reduced. Secondly, VLBI data analysis will benefit from a constant constructive competition and interchange of different ideas. Analysis Centers are invited to contribute papers related to their current activities on the development and comparison of analysis strategies, models and software. Ruediger Haas The analysis of VLBI observations produces time series, long-term average positions and rates, and values of physical parameters. Suggested topics include the use of such VLBI results in modeling geophysical fluids from the atmosphere to the core, nutation/precession, refinement of the terrestrial and celestial reference frames, interpretation of the motions of specific sites and sources, astrophysical investigations, tests of relativity, and other scientific uses of geodetic and astrometric VLBI data. The investigation of the troposphere and the ionosphere by VLBI plays also an important role. Another area is the comparison, validation and combination of VLBI with other space geodetic techniques in the frame of the new IAG project IGGOS. Submitted Papers Abstract submission is closed. If you want to submit a late abstract, please contact the Program Committee chair Nancy Vandenberg. Manuscripts for proceedings will be due February 27, 2004. Instructions for submission of papers were posted during the first week of December (see Proceedings section of this page). Information for Authors The schedule for oral and poster presentations is shown in the booklet to be printed for the meeting. Refer to the program section of this page for other files that can be downloaded prior to the meeting. Both oral and poster papers will be published in the meeting proceedings. Please see the proceedings section of this page for instructions on preparing manuscripts. All oral papers are 15 minutes, including discussion. Invited papers are 30 minutes, including discussion. Presentation equipment will include a PC projector, two overhead projectors, a wireless microphone for the speaker, and a laser pointer. Posters may be put up in the poster room Monday morning. Posters will be left up for the duration of the meeting. The space available for posters will be 6 feet tall by 4 feet wide. Materials for mounting posters will be provided. Proceedings Papers presented at the General Meeting will be published in a volume of Proceedings. The proceedings will be published as a NASA Conference Publication. The reference should be cited as follows: IVS 2004 General Meeting Proceedings, edited by N. R. Vandenberg and K. D. Baver, NASA/CP-2004-212255. Authors must follow the instructions for manuscript submission. The deadline for submission of files for publication is February 27, 2004. Presentations The presentations page has links to authors who have submitted files with their presentations. You can also browse all presentation files. Local Information Weather. The mean temperature for February is -8 C, with average high at -4 C and average low -13 C. It is not unexpected to have temperatures as high as 0 C and as low as -30 C.
Check weather conditions at http://www.theweathernetwork.com/weather/cities/can/pages/CAON0512.htm or, http://weatheroffice.ec.gc.ca/forecast/city_e.html?yow. Local transportation. The Lord Elgin Hotel is very centrally located in the city of Ottawa, and many will not wish to rent a car. 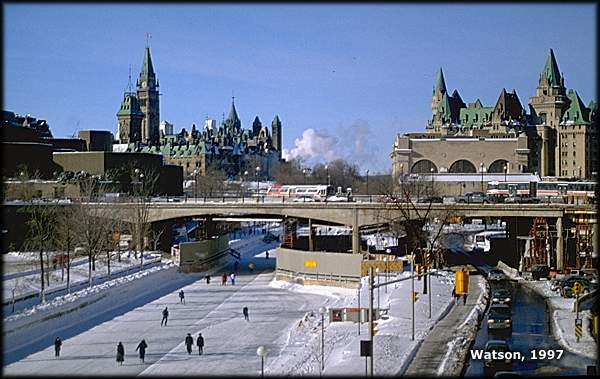 For example the Rideau Canal (skating outdoors), Canada's Parliament buildings, and many of the Winterlude Events are within one km (half a mile) of the hotel. Transportation from the Airport. The airport is reasonably close to Ottawa, making transportation into the city quite convenient. A regular Airport shuttle services the Lord Elgin hotel daily every half hour at the cost of $12.00 one way and $20.00 return. Taxi fare is approximately $25.00 one way between the hotel and the airport, and is more convenient. The total time for the trip is about 20 minutes. For the very frugal, Ottawa bus route 97 runs from the Airport, exit at the METCALFE Stop and walk one block south on Elgin. Fare is $2.50. Information at www.octranspo.com. Currency. The U.S. dollar is widely accepted in Canada and can be used for purchases in major retail stores. Other currencies are not accepted. However we recommend that conference attendees use Canadian Dollars as smaller stores will have difficulties handling U.S. Dollars. A bank is at the Ottawa airport where currency can be exchanged. A number of banks are near the hotel. An international currency exchange office is in the Rideau Mall, approximately one kilometer from the hotel. Events. The meeting will be held during the annual Winterlude festival in Ottawa, celebrating Canada's unique northern climate and culture. Many activities will be available such as skating, ice carving, and snow sculptures. Skating on the Canal in Ottawa, near the Lord Elgin hotel, with a view of Parliament in the background. Excursions The LOC has arranged for several tours on Friday, February 13, following the meeting. Please visit the excursions page for the details. This page also provides detailed information about activities available in and near Ottawa. Invitations IVS will send a letter of invitation to attend the meeting as a means of support. If this would be of assistance for your travel plans, please contact the IVS Coordinating Center to request a letter. If you need a letter from the Canadian meeting host, please contact the Local Committee. Unfortunately there are no funds to support travel to the General Meeting. Mail may be sent to the Program Committee at ivs-gm2004pc@ivscc.gsfc.nasa.gov. Please feel free to contact any member of the Local Committee with questions, comments, or suggestions. Pictures Pictures were taken during the meeting by several people. Each link is to a web page with small thumbnail images. Click on an image and the full size picture will be downloaded.